1 large Sage Fruit Peach, (peeled & pitted and chopped into bite size pieces). Preheat oven to 400 degrees (position oven rack in the middle of the oven). In a small mixing bowl add butter and honey and beat at high speed until the butter is light and fluffy. Place in a small serving dish or bowl and set aside. In a medium sized mixing bowl add biscuit mix, 1 cup of buttermilk, sugar and cinnamon. Mix with a fork until dough is well combined and holds together. Grease your hands with oil and using your finger tips gently work peaches into the dough. Spray baking sheet with cooking spray and using an ice cream scoop, drop 8 to 9 mounds of dough onto baking sheet (space dough at least 2 inches apart). Using a pastry brush, brush remaining buttermilk on the tops of each biscuit (this will give the biscuits a nice golden shine). Bake in hot oven for 8 to 10 minutes until tops are golden. Remove from oven to cool slightly. Enjoy biscuits warm with honey butter! 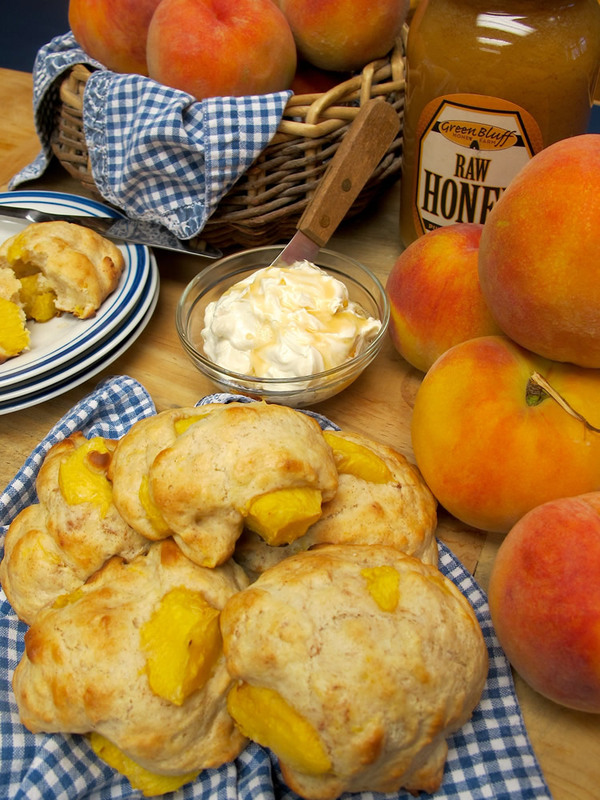 Leftover biscuits can be frozen in freezer bags and used to make delicious peach short cakes, too!